I am using a Motif XF7 as well as a MOXF8 and have recently just for curiosity checked the MODX. Through I did not discovered enough advantages to justify a change there is one sound which I liked very much, the CFX PopStudioGrand. Is there a way to get this for the Motif XF, or does anyone know a similar one for the Motif XF? 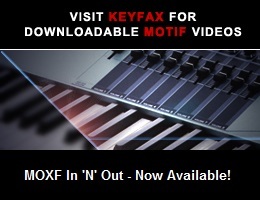 I sincerely doubt that Yamaha will ever make CFX samples available for the Motif family. They want you to buy a CP4 Stage Piano or Montage/MODX. Have you tried any pianos other than the factory ones on your XF or MOXF? It’s my understanding that the so-called “CFX Grand” is based on samples from a CFIIIS. If you don’t already have it, the CP1 download (http://download.yamaha.com/file/60662) also uses CFIIIS samples. I haven’t heard the CFX PopStudioGrand, but often piano Voices can be tweaked to more closely emulate a different piano. If you don’t mind using a computer, some third parties have sampled the Yamaha CFX and produced very large (many GB) virtual piano libraries.